Got back into porting these '76 930 cylinder heads today. 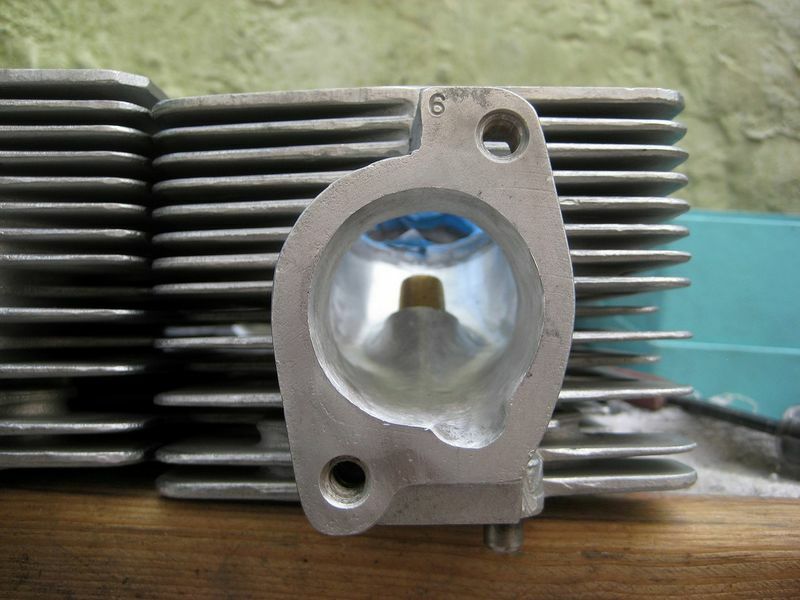 I enlarged and smoothed the 32mm intake ports to 40mm to match some 40mm aluminum CIS injector blocks I have. The valve guides are new and the valves and seats freshly ground so I have masking tape on the valve seats and pieces of rubber hose on the valve guides to protect them while doing this. They aren't finished yet but they're getting close so I stopped and snapped some pics. The first pics is from a couple weeks ago when I started hogging them out to around 39mm with a carbide burr. Are you scribing a 40mm circle and grinding out to it? x: 62 356, 64 356, 76 930, 84 911 Targa, 85 ROW 911, 00 996, 07 Cayman S.
Here's another one from a couple weeks ago. Its blurry but you can see the black sharpie pen mark and scribe mark a little better. I put in 2 studs and slid the injector blocks on and used a sharpie pen and machinest scribe to make the guide mark. and another one from today. Awesome Jim, there's a lot of power hidden in those heads just waiting to get out! 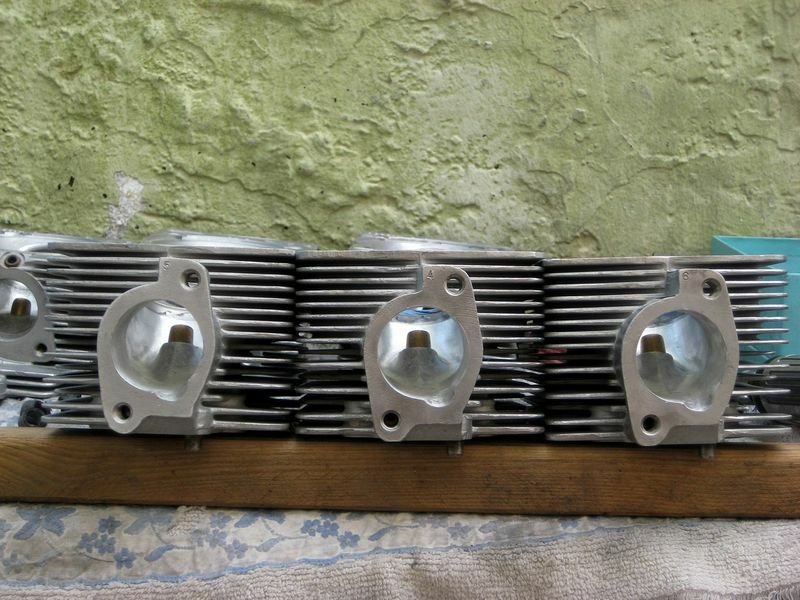 I bought these heads around 5 years ago with the valves and guides already done on them for a good price off the classifieds here. It became quite an experience actually getting them but with some help from another pelican I finally got them... They had the long 930 intake studs on them too. 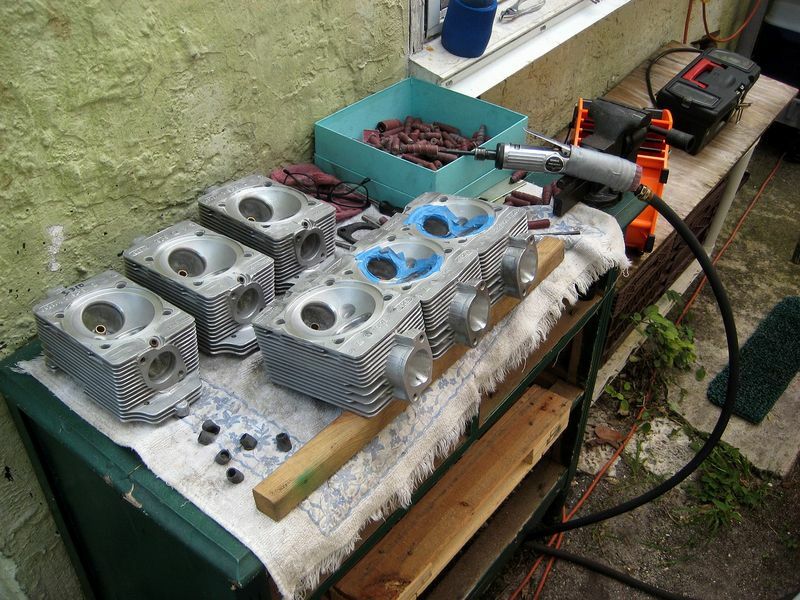 '76 930 heads are for a 3.0 with 95mm bore so I took them up the road to Bill @ Xtreme Cylinder Heads And Castings and he cut the 1mm bevel around the edge of the combustion chambers so I can use them on a 97mm bore 3.3 motor. Porting is so stress relieving. Wished I'd have done my 3.2 heads during rebuild but hearing stories of flow loss from cleaning them up from others here prevented me from doing so. 40mm creates a lot of room there! Wow..beautiful work. I am impressed with your porting consistency from head to head. Jim, when you complete the porting I recommend taking the heads back to Xtreme and having them analyzed on the flow bench and touched up. Also, replace the painters tape your using with some gaffers tape. Painters tape is good for paint masking and not much else. Last edited by 911nut; 06-21-2013 at 04:19 AM.. I don't have the spare $ to take them up to Xtreme and have them do anything more to them. I did a little more with the sanding cones after I took the last pics yesterday and I'm basically done with the porting. There is just a little minimal sanding cone touch up to do here and there for my own visual satisfaction. 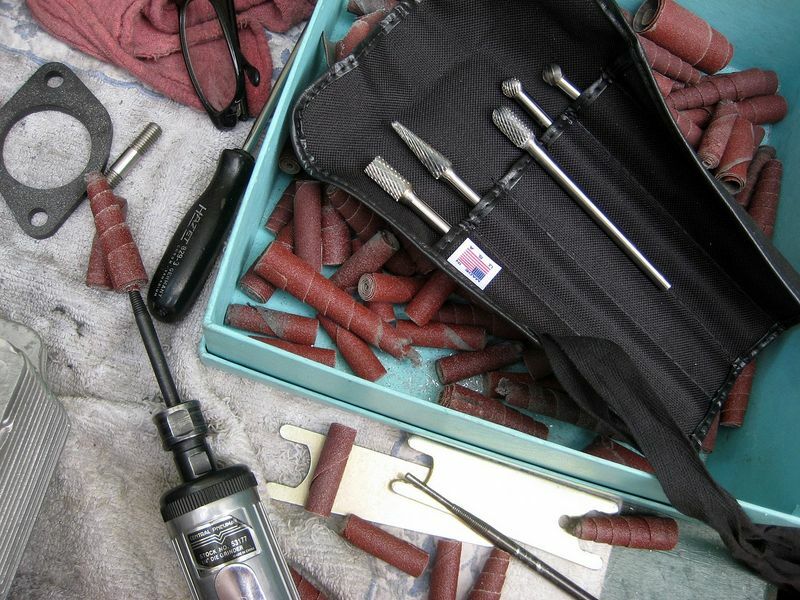 It would be interesting to have them checked on a flowbench but thats expensive and they look really good to me. They will have a big improvement of flow in the 3500-6800 powerband rpms with my 964 cams timed at 1.26mm intake valve lift at TDC (overlap) before the intake stroke compared to the stock 32mm ports. I carefully stayed away from the valve seats with the grinder and sanding cones so two layers of masking tape there worked OK for me. Gaffer tape or even duct tape is tougher though so that would be better. The pieces of rubber hose on the valve guides worked great at protecting the valve guides. Porting should be done before new guides are installed but new ones were already installed when I bought these heads. 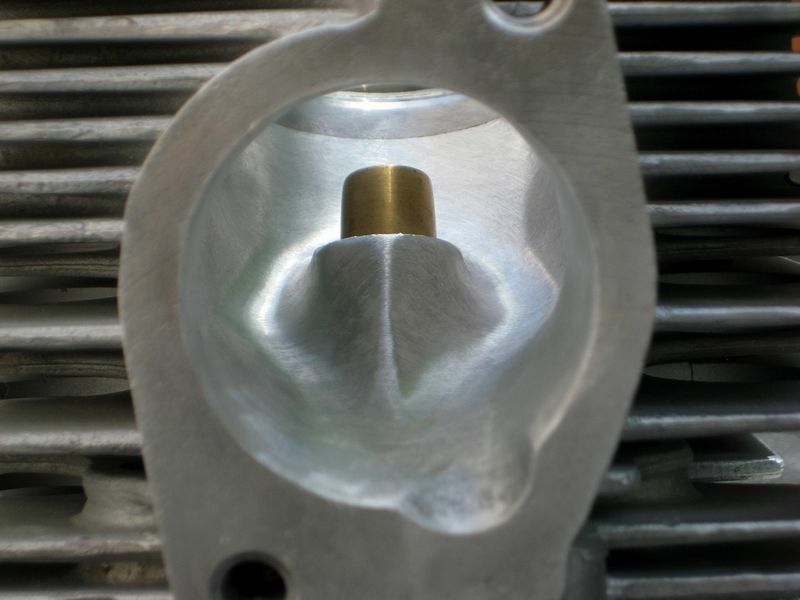 Getting all heads to flow perfectly equal on a flow bench while an intake valve is in place and open a certain amount would be optimal for a race engine with 6 individual throttle bodies but for a street car engine with the pancake mainfold I wouldn't notice any benefit. The 930 flat pancake intake manifold I'm using doesn't come close to equal flow to each intake port and from what I've read the Carrera manifold doesn't either but of course it's better than a 930 manifold. This isn't the first time I've done this and what I've done on my limited budget gives me satisfaction and is good enough for me. 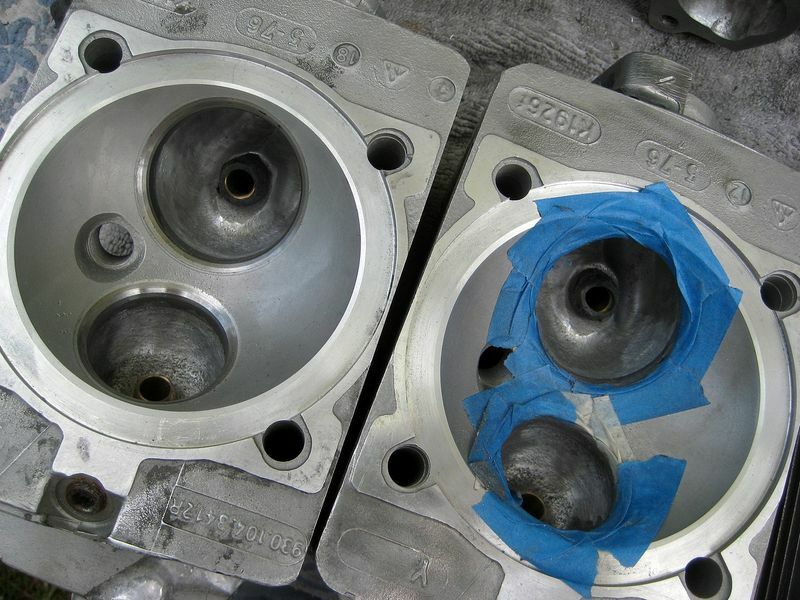 After final visual and feel with my finger inside the port touch ups I'll hand lap the numbered valves to the valve seats and put them back in a box and store them. I also have new Mahle 930 3.3 pistons and cylinders from a sealed box, Glyco rod bearings and small end bushings, and ARP head studs I bought 5-6 years ago. Maybe next winter when it cools down I'll redo the top end but for the rest of this summer I'll just enjoy driving the car with the AC on. I love this forum for just these posts. I can't believe how many guys are the do-it-yourself types on here!! I ported some 2.7 heads for weber manifolds many years ago, and had a local machine shop cut the initial diameters on a mill. IIRC something like 38mm intake, 35mm exhaust. He cut the straight depth (about 3/4"-1" deep) and only charged me $150 total for all 6 cuts. All I had to do was the final blending. Saved a ton of time. Thanks, and yeah, it's just the first inch and a half or so you open up. The rest of the bowl area and short side radius is just smoothing and blending the casting marks and crude factory machine work just below the valve seat. 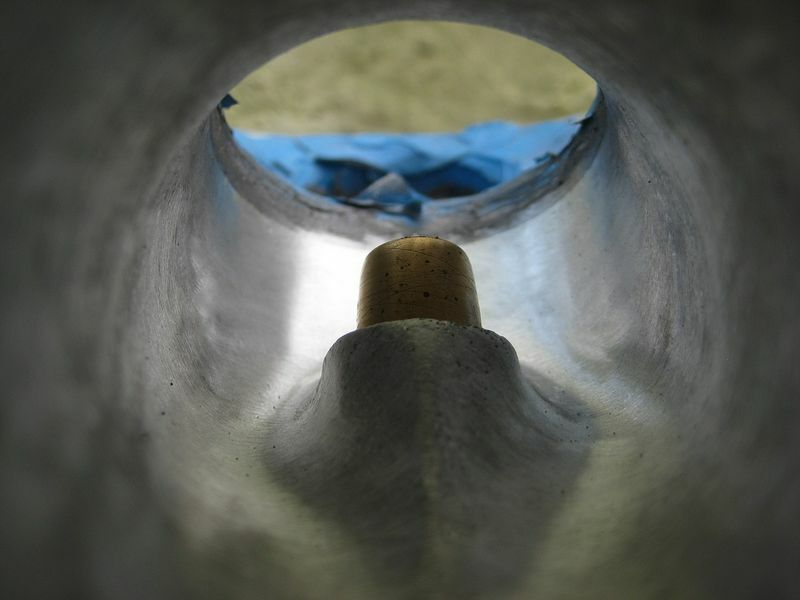 You do not want to remove much material from the short side radius and some people add material there by welding in more aluminum and then regrinding the short side radius contour so the mixture is lifted up higher before it curves and goes over the short side radius. 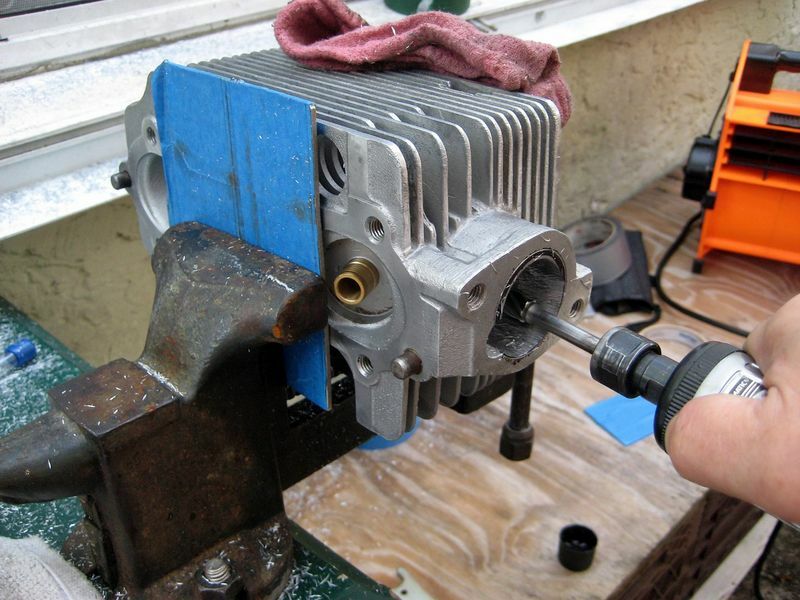 That way it has more room to straighten out before it hits the back of the intake valve. 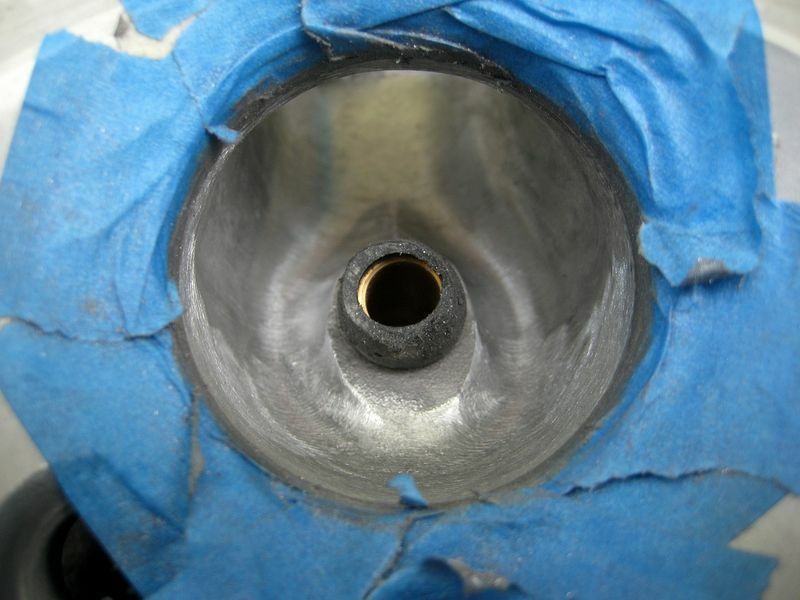 That reduces bad turbulance at the back side of the intake valve opening radius and increases flow CFM into the combustion chamber. Even more so in normally aspirated motors. It's the opening up the first inch or so of 930 heads from 32mm to whatever you decide to go with that makes 95% of the difference. The rest of the bowl area and valve guide streamlining is already good from Porsche and smoothing and blending that area really doesn't make much difference, especially in a forced induction motor. Every little bit helps to some degree though even if it's only in your head. Nice work and brings some memories. 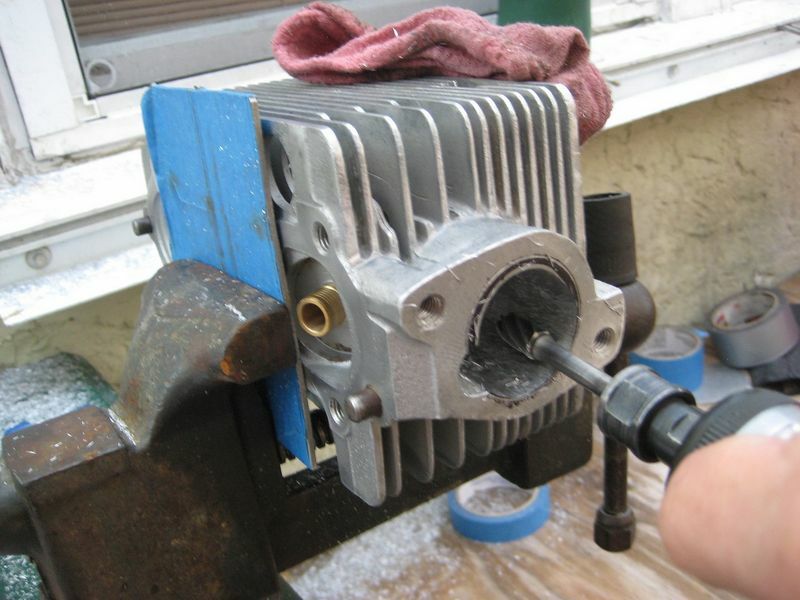 You inspire me to dust off my carbide cutters and work on my spare engine. I would be very interested in before and after numbers or impressions. I'm interested in after impressions too. The car runs perfect right now but the exhaust valve guides are worn like most 930's are after 40,000 miles. It's too hot and humid here in S. Florida to get into it during summer unless it was really needed. I'll be doing this in my driveway under one of those tarp roof outdoor canopies so maybe I'll do the top end next winter when it cools off here. I'll port match the pancake manifold holes from 32mm to 40mm to match the injector blocks too but that shouldn't take long. The heads are finished for now. Here's a quick pic I just snapped with a little pocket camera in uneven outdoor available light. They all look like this now.